In a neighborhood that percentage-wise has more children under the age of 17 than any other in Kalamazoo, a little known youth-centered nonprofit is having a positive impact. Over the eight years of its existence, Eastside Youth Strong, under the direction of Sam Lealofi, has been offering Eastside youth a variety of programs to increase their academic and social-emotional skills using high-quality, time and research-proven curricula and assessments. Lealofi is no stranger to the Eastside. As a former Eastside Neighborhood Association director and Eastside resident, Lealofi says she was delighted to be asked to lead the program because she had long wanted to provide more quality programs for Eastside youth. A spirit of curiosity and cooperation infused CHAMPS free time at the end of the day. Photo by Eric HennigUnder her direction, Eastside Youth Strong, funded by the Kalamazoo Community Foundation and the Irving S. Gilmore Foundation, among others, has implemented well-tested, successful initiatives, starting with CHAMPS, its after-school program. And Lealofi has done her research and chosen the models carefully, providing appropriate training for the staff and regular assessments. The strategy is working. It could be argued that in a neighborhood that does not have its own elementary school (most of the students Eastside Youth Strong serves attend Northeastern Elementary in Eastwood), it is even more vital that quality after-school and enrichment programs are located within the community. 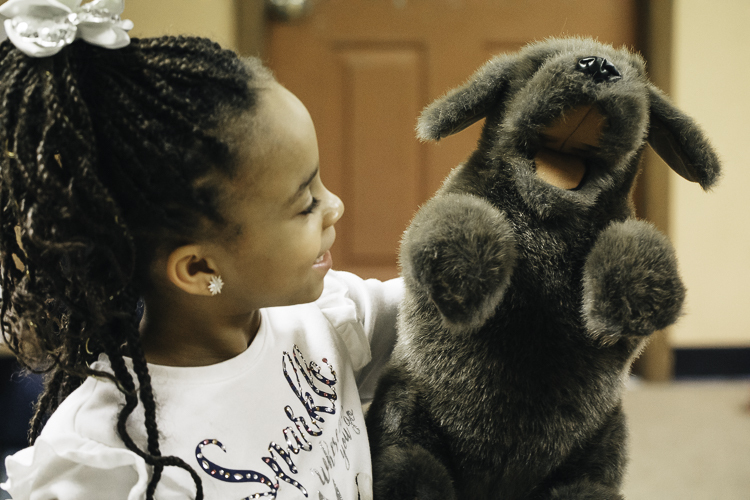 Many of the students walk to CHAMPS, the kindergarten through fifth-grade after-school program, which runs from 4:30 p.m. to 7: 30 p.m. Mondays through Wednesdays at the KENA building, 1301 E. Main. In 2001, a committed group of Eastside community leaders and residents, called the Kalamazoo Center for Youth and Community, wanted to launch a capital campaign to build a youth recreational building on the Eastside. But before enough money was raised, the recession hit and the idea floundered for lack of financial support. For 15 years, the city sponsored a city-run youth center on East Main, but eventually, it closed. “We really appreciated the spirit of the city and the director of Parks and Rec for committing to that youth development center,” says Lealofi. In 2011, however, Lealofi was approached and asked if she would consider running the Eastside youth program and she agreed. 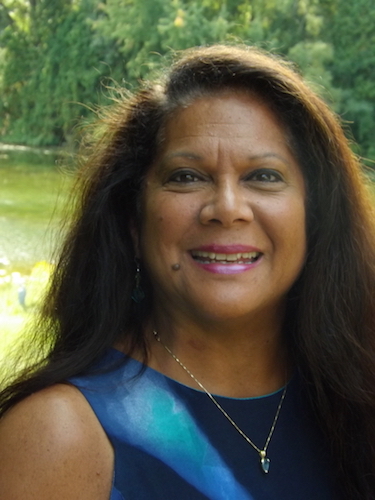 Sandra (Sam) Lealofi is the Executive Director of Eastside Youth Strong, a progressive after-school youth program. She has directed the program since its inception in 2011.Lealofi set to work, researching the neighborhood offerings and national programs. Where were the gaps? She wanted a high-quality youth development model that used national quantitative tools to help staff and community partners. 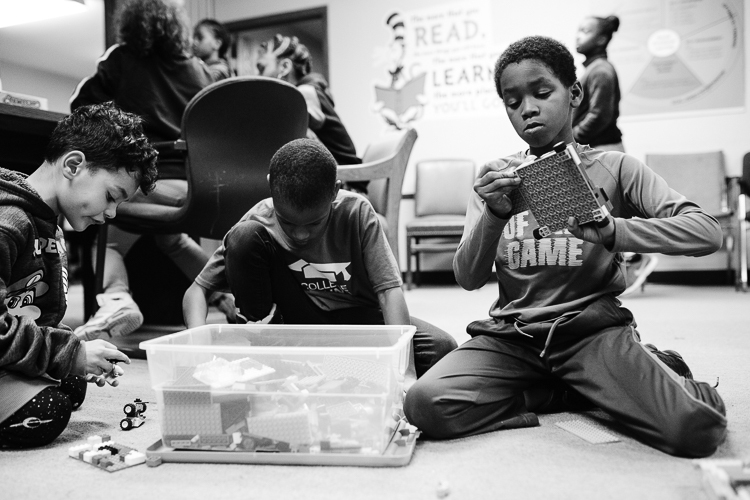 Eight years later, Eastside Youth Strong has added four more programs to CHAMPS: Individual Student Services, a literary support, and tutoring program in conjunction with Northeastern Elementary School, EASEL, a summer STEM program, Check & Connect, a progressive school retention program, and a satellite of the Boys & Girls Club at Northeastern Elementary. “We now have increased high school graduation, helped create a college-going culture, and are bringing in more partnerships to support youth and family,” says Lealofi. One of the critical aspects of increasing potential for youth on the Eastside, Lealofi found, was school retention. Because CHAMPS keeps in close contact with the schools, Lealofi learned that “50 percent of the kids in our afterschool program weren’t going to school during the day,” she says. So Lealofi began looking around to see what programs were successful for ensuring school retention, and she decided on the University of Minnesota’s Check and Connect model, which tracks a young person in terms of attendance and grades, but also seeks to actively engage them. The challenge is keeping kids connected is showing them why it’s important to engage, and that’s where William Huddleston, case coordinator and case manager, comes in. He works closely with the schools, students and family to establish that engagement. Many Eastside youth do not have many opportunities to venture outside of their neighborhood except for school, says Lealofi. So a key component in CHAMPS and EASEL is to connect youth with community partners, such as the Kalamazoo Nature Center, the Air Zoo, the Fresh Food Fairy, professors, Southwest Michigan Land Conservancy, and Kalamazoo Valley Community College, among others. 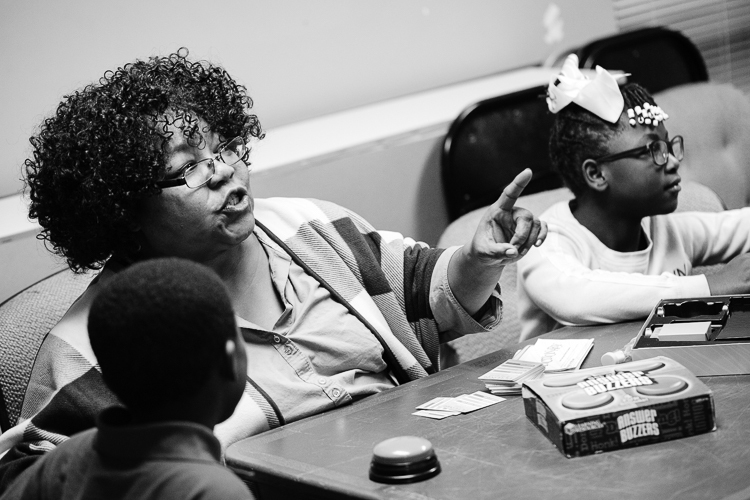 Heather Taylor, Assistant Lead Teacher, is always up for a good game with CHAMPS youth. Photo by Eric Hennig“It’s just awesome and refreshing and enlightening to have others come in to show the kids things because a lot of them don’t get out of the neighborhood too much,” says Taylor. “Youth voice,” through youth leadership and initiation is a central tenet of CHAMPS, says Lealofi. An impressive amount of recent research has demonstrated that meditation and mindfulness have significant benefits for children, including helping with emotional regulation, reducing anxiety, alleviating depression, and increasing overall health and wellbeing. CHAMPS worked with the Western Michigan University Medical School’s Active Citizenship Program to “galvanize mindfulness, especially from a health perspective,” says Lealofi. So following homework time each day, students spend time meditating and learning mindfulness skills. “If you’ve had a busy day, a tough day, an exciting day, or something scary is coming up that you’ve anticipated, we want to use the strategy of mindfulness to lower the stress and over-stimulation,” Lealofi says. And for many of CHAMPS’ youth, meditation time is a welcome respite. In fact, according to Taylor, several students volunteer to lead meditations. And the CHAMPS group even led a meditation for youth service workers recently at the Kalamazoo County Juvenile Home. With its five programs, Eastside Youth Strong is reaching a lot of youth But CHAMPS and EASEL, which are at capacity now with 15 to 20 children, don’t have much room to grow. Over the eight years she has been working with the program, Taylor says she has seen tremendous improvement in the kids in terms of confidence and leadership skills. Because of the success with school retention and assessed growth in social-emotional, as well as academic, skills (all of the youth are now reading at grade level and testing above former levels for social-emotional skills), Taylor says Eastside Youth Strong has become a “poster child” for other youth-centered programs. And while small is sweet, Taylor says she would still like to see the program grow because the neighborhood need is great. Lealofi agrees, though if she has to choose, she believes that a small, successful model is preferable to a large, unfocused one. She has already observed ways in which EYS has helped strengthen Eastside families. “What I see is parents who themselves were not supported in their educational experience appreciate the support from CHAMPS so much,” says Lealofi. “As long as we build that support into our culture, it does seem to ripple out. CHAMPS youth enjoy a moment of rest after bicycling with Open Roads on the Kalamazoo Valley River Trail. As any director will say, programs and plans are well and good, but if you don’t have the quality staff to lead them, your best-laid plans may go awry. Sam Leolofi, director of Eastside Youth Strong staff, says her staff is more like family, and it helps that both Heather Taylor, Assistant Lead Youth Development Worker and Yulonda Taylor, Lead Youth Development Worker, have long track records working with youth, and that the ENA director, Pat Taylor, has been in her position for 10 years (“a Taylor-palooza,” Lealofi calls it, “though they’re not related”). Add the skilled science teachers of EASEL, Rebecca Joyce and Dan Keto, and William Huddleston, program manager and case coordinator, and you have a cohesive, committed group. In terms of Eastside youth, Yulonda Taylor is a neighborhood expert. 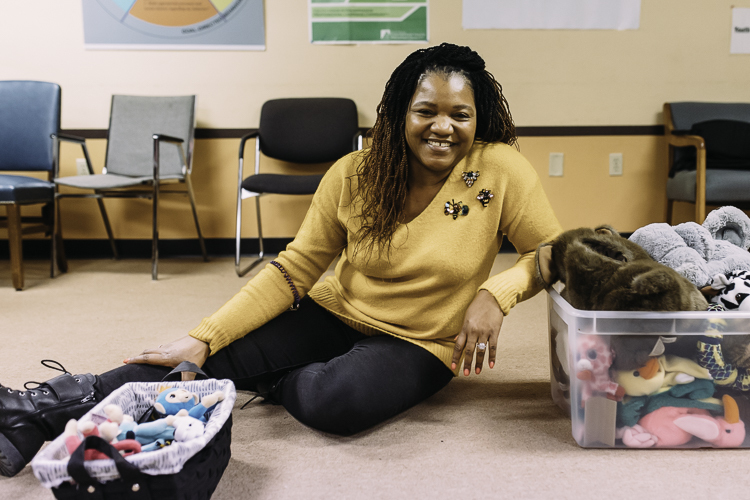 As a longtime Eastside resident who has raised her two children in the neighborhood, then worked for years at the city-run Eastside youth program on East Main before accepting the job at CHAMPS, Taylor has a neighborhood reputation as Mother Hen. And if students say they don’t have homework, not a problem. Taylor has a back-up stock of workbooks and worksheets. Her day job is as a teacher’s assistant at Northglade Elementary School, as is Heather Taylor, so finding resources is second nature. Sometimes she has to turn to the computer to teach herself how to teach them, she says. Living in the neighborhood means Taylor sees the students “out and about,” like at the grocery store.